June 22, 2009 Elizabeth Louise “Betty” Allen, operatic mezzo-soprano, died. Allen was born March 17, 1927 in Campbell, Ohio. She earned a bachelor’s degree from the Hartford School of Music in vocal performance and her first major performance came in 1951 as the soprano soloist in “Jeremiah Symphony” with the Boston Symphony Orchestra. She made her opera debut the following year in “Four Saints in Three Acts.” Also in 1952, Allen won the Marian Anderson Award. In October, 1954, she made her New York City Opera debut as Queenie in “Show Boat.” From 1960 to 1975, Allen was a regular guest artist with Leonard Bernstein and the New York Philharmonic. She also toured internationally during that time as a concert singer and recitalist, appearing throughout North and South America, Europe, and Asia. 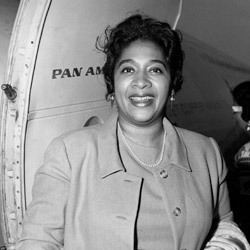 Allen’s opera career ended in the late 1970s and in 1979 she became the executive director of the Harlem School of the Arts, becoming president in 1992. She was also active with numerous arts organizations, including the Board of Directors and Executive Committee of Carnegie Hall and the National Foundation for the Advancement of the Arts.